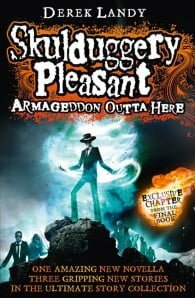 For the first time, every Skulduggery Pleasant short story is collected into one magnificent volume. But that’s not all… Written specially for this collection, there is an entirely new novella that will drag you into a nail-biting American horror story, Skulduggery-style, and three brand-spanking-new stories spanning the last 150 years. Introduced by Derek, this is the hidden history of the skeleton who saves the world… and the girl who’s destined to destroy it.